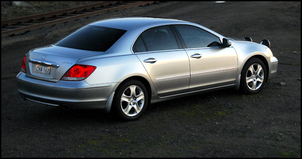 My 2006 Honda Legend has a good coefficient of drag (Cd) of 0.29 from the factory. Despite the relatively large frontal area, high weight (about 1.9 tonnes), all-wheel drive, and 3.5 litre petrol V6, the car gets competent fuel economy on the open road. In fact, on my 80:20 country:urban drive to work I typically get an indicated 8.8 litres/100km (on 98 RON fuel). This is indicative that the drag figure is indeed low. However, these drives show evidence of a very interesting airflow pattern on the rear window. So why is that of any importance? The big trick with getting low drag in a sedan is to have attached flow down the back window and onto the boot. 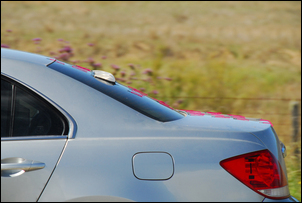 This causes a higher air pressure on the rear glass and leads to a smaller wake area of disturbed air being dragged along behind the car. Both reduce drag. Driving the Legend after overnight rain, when the ungaraged car has been thoroughly soaked, shows a progressive clearing of the rear window of the water film. This clearing occurs as a result of airflow over the window. (Note that I am not talking about discrete droplets but an overall film of water.) Watching the water film in the rear vision mirror shows that, after about 30 kilometres at 100 km/h, the film down each side of the rear glass is gone, but a patch remains in the middle. The patch (highlighted here in yellow) is directly in line with the high level brake light and the same width as the light. (It’s not the light that is causing problems - the light is on the cabin side of the glass – but it is a good indicator to line up the patch with.) It takes perhaps another 20 kilometres for all the water film to be gone. This patch of water film remaining the middle of the rear glass implies that the airflow is not attached down this portion of the glass. This is not uncommon – flow that wraps around the C pillars will often contribute to the air that moves on the rear window, so it’s the middle that’s the hardest to get right. So that was my theory – but was there any further evidence that this flow pattern was occurring? By far the best way for an amateur to examine airflow patterns on a car is to wool-tuft it. This is where small lengths of yarn are stuck to the car with tape, and then the car is driven and the airflow pattern observed. Where the flow is attached, the tufts will line up, wriggling only a little. Where the flow is not attached, the tufts will whirl around in all directions, sometimes even standing on end or momentarily facing into the airflow! If attached flow were in fact occurring from the roof, down the rear window and then onto the boot lid, the wool tufts would all line up in this direction of flow. But if there was unattached flow in the middle of the window, the tufts here could be expected to be whirling – and you’d also then expect poorer flow onto the centre of the boot lid. I stuck some wool-tufts to the car and got an assistant to drive the car past where I stood, taking photographs. 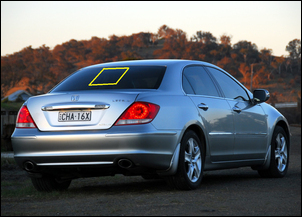 The flow separation on the window and then the boot lid are highlighted here. So what could be done about this? 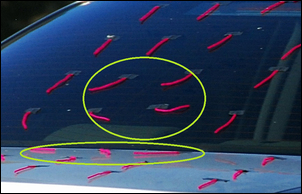 Maybe – vortex generators? Vortex generators are designed to energise the boundary layer, putting forward momentum back into the zone of thickening, static air. This causes the flow to stay attached for longer. 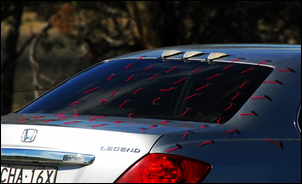 The best off-the-shelf vortex generators I have found are AirTabs. Could placing some AirTabs at the top of the rear window, directly above the zone where flow separation was occurring, reduce the separation? Vortex generators are easily temporarily attached using tape. 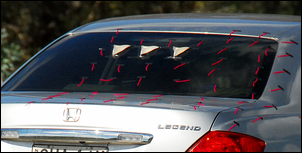 This photo shows three vortex generators located at the top of the rear window. However, the flow has not been changed. Note the flow separation at the lower part of the window, and the very clear separation bubble on the forward edge of the boot lid – in fact, two tufts were standing up at the instant this pic was taken. So what if the AirTabs were moved further down the glass – so that they were located just ahead of where the separation bubble was occurring? This pic shows that the presence of the AirTabs located further down the window are altering the flow pattern of the air. The flow separation on the lower part of the window is a little improved, as is the airflow on the forward part of the boot lid. However, it looks very much as if three AirTabs aren’t enough – there is flow separation to the left and right. With four AirTabs in place we can see that the flow on the lower part of the window, and the font part of the boot lid, are now excellent. Not able to be seen in these pics, most of which were taken with a shutter speed of 1/1000th of a second or more, is that the tufts are far more stable in their movement than prior to fitting the AirTabs. This shows how good the flow is off the rear window onto the boot. In fact, it is now the best of any three box sedan I have ever seen wool-tufted. And rear vision with the AirTabs in place? It’s actually not at all impaired – an outcome resulting from a combination of seat height, my height and interior rear vision mirror height. So the airflow looks better attached, but is there a reduction in drag? With the vortex generators in place the fuel economy has clearly improved. Rather than 8.8 litres/100, the average in this sort of driving is now about 8.5 litres/100 – an improvement of about 3 per cent. Furthermore, the ‘best ever’ fuel consumption I can get is also clearly improved – on a particular drive I do frequently (80 kilometres, all at 100, 110 or 90 km/h speed limits) I have seen 8.2 litres/100km – completely unachievable previously. The Legend, complete with active noise cancellation through the sound system, is already a very quiet car. However, I think that there has been a very small reduction in aero noise from the rear. Wake noise is heard as a dull roar, and it is this that I think is reduced. 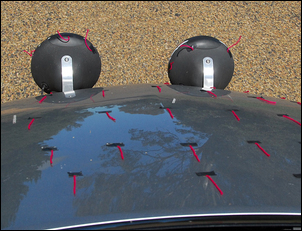 If you are interested in car aero, for ease of convenience, instant results and low cost, nothing beats some wool-tuft testing. 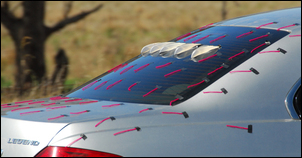 If flow re-attachment needs to be promoted, vortex generators can be very effective. In my case, I am simply amazed at the improvement I have been able to make at low cost and so simply. To facilitate vision during my long drives, many of which occur in the dark, I have fitted a pair of huge Narva 225 lights. With the custom tuned mass vibration dampers (see Mounting big driving lights, Part 2) and Osram HID bulbs and ballasts, these are by far the best lights I have ever used. But do they wreck the airflow pattern on the bonnet? I remember many years ago wool-tufting the bonnet of a car with and without the standard pop-up lights raised. When the lights were retracted, the flow pattern on the bonnet was perfect – but when the lights were raised, the flow over around half the plan area of the bonnet was terrible. Was I causing the same effect on the Legend’s bonnet? I transferred the wool tufts from the rear window to the bonnet. The legend has a sunroof and with an assistant driving, I was able to take very clear photos through the sunroof of the bonnet and lights’ airflow pattern. Much to my surprise, the flow pattern on the bonnet remains excellent. Directly behind each light body, the flow detaches, but reattachment on the bonnet is almost immediate - partly helped, no doubt, by the very thin boundary layer that exists at the front of the car. If you find DIY car aerodynamics fascinating, you may be interested in my book – see https://www.createspace.com/4201918.